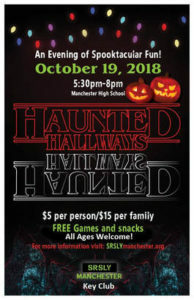 Join SRSLY Manchester & Key Club Friday October 19th for their annual Haunted Hallways! This event will be held at Manchester High School from 5:30pm-8:00pm. All ages are welcome to enjoy a spooktacular night filled with games, prizes, a kids hallway, candy, and of course our scare hallways! There is a $5 admission at the door and a $15 admission for families. This money helps support SRSLY Manchester and Key Club. We look forward to seeing you ghouls and goblins Friday Oct, 19th, 2018!